Grassy Creek Brooms takes you back in time, reflecting a structure and design descended from the Shaker and Puritan eras. 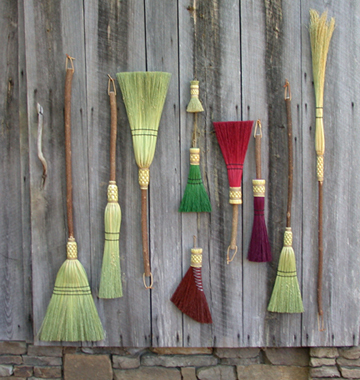 Using non-mechanized tools from the past century, each hand tied broom is an original. While maintaining the traditional integrity of the broom, Jerry and Judy incorporate contemporary flair through the expression of their individual talents. As the Lovensteins produce a necessary item for the home, they add their signature among the generations of broom squires in a centuries old craft. Experience for yourself the difference a fine handcrafted broom can make to your everyday sweeping.